This morning we had what we call a "gas parade." That is where we go to Smith's, pay for gas and then line up, taking turns filling all of our cars, so we can all use the Rewards Points gas discount. Right now they're giving double rewards, so we filled our tanks for $.30 per gallon less. As I was pulling out of the gas station, I saw a site that took me back many years. 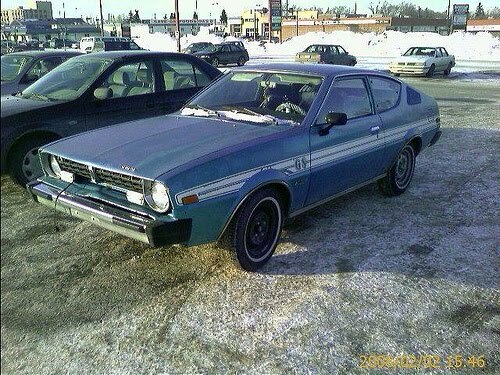 It was an old, blue Plymouth Arrow. I had one of those once. Let me tell you about Bullet. It has been many years since my first car, Bullet, sputtered to a stop by the side of the road—and died. I’m sure that to most, Bullet was nothing more than metal, fabric, paint, rubber and various fluids, not too beautifully assembled, but somewhere between his birth at a factory in Michigan and my ownership of him, he gained not only a personality, but a sense of humor. I realize that Bullet isn’t a very warm and welcoming name. In fact, it may have been his resentment of this name that caused him to seek revenge against me. But somehow, the name fit. Bullet was a 1976 Plymouth Arrow. During my eighteen months of missionary service, Bullet was parked in the shadows of our barn. We had a young bull who decided to ram the car repeatedly with his new horns. By the time anyone realized what was happening, my car looked like it had been shot in about fifteen places with a rifle. It didn’t take too much rain and humidity to cause those holes to begin to rust. He looked like he’d been used for target practice. Bullet was ugly, but like bulldogs, he was so ugly he was almost cute. He had character that some of my friends’ newer models could only hope to live long enough to acquire. Oh, the stories he could have told. At the end of Christmas break in 1986, my friend, Lara, and I loaded up Bullet, left our homes in Missouri and headed west for college. Unfortunately, Bullet wasn’t too keen on the idea. In Kansas, snow started falling. Within an hour, it was a full-fledged blizzard. We were engulfed in white. Snow started building up on my car and we pulled over regularly to kick the snow off the wheel wells and clean off the windshield wipers. As we continued driving, an evil force took over the windshield wipers. The right wiper began wiping off of its usual course. The wipers were no longer synchronized. The right wiper occasionally bumped into the left, threatening to get caught, and then pulling away. Within a couple of minutes, the right wiper had shifted its course completely and was now wiping off the hood of the car. It gradually worked its way back to the windshield, where it fought again with the left. The left wiper tried valiantly to stay the course, but eventually lost the battle as the two wipers caught, stuck together, wiggled and eventually pointed together at the road ahead, no longer wiping anything at all. Bullet was an oil burner. He got great gas mileage, but he drank oil like an alcoholic—one quart after another. He wasn’t just a social drinker, enjoying an occasional drink with his buddies, he had a major addiction. As I look back, I realize I was an enabler in this addiction. I fed the beast its oil—about a quart every hundred miles. I was afraid to refuse Bullet, knowing that if I did, he’d retaliate and give me the silent treatment. So I bought oil by the case, not the quart, and kept it in the back of the car. I still owned Bullet when I had my first real, adult job. He was my commuter the fifty miles each way to work. Almost every morning, I’d add a quart of oil before leaving home. One day, I realized I’d left the oil cap at a gas station. Not wanting to leave the hole uncovered until I could purchase a new one, I plugged the hole with a rag. That hot afternoon, as I was driving home, singing along to my cassette tape of Billy Joel, Bullet began to cough and sputter. He seemed sluggish and tired. I guided him gently to the side of the freeway, barely making it onto the shoulder before he rattled, sighed, and took his last breath. I got out and lifted the hood, hoping I could figure out what was wrong. Shoot, I thought, as I realized the rag was missing. It must have fallen out. A friend, Rex, helped me tow Bullet to a shop, where I explained what had happened. The mechanic shook his head as I told my story, then grabbed some long, needle-nosed pliers and began pulling out pieces of rag from in the hole. The mechanic tore the engine apart and found bits of rag in every part. I had killed Bullet. I had smothered him with the rag. He was gone. The shell of my car sat in my driveway for several weeks while I came to terms with his death. Bullet is now buried with those of his kind in a junkyard about twelve miles from my home. I was paid 27.08 for him. He is missed. I doubt there will ever be another Bullet. i have heard that story many times without that much detail. this one was hilarious once you added the details in. i was laughing ... OUT LOUD. i LWS (laughed with sound) at this story. great detail. thanks for sharing.